A few years back I was attending Weight Watchers and one of the members there shared this recipe with us as a lighter dessert option to pumpkin pie for our Thanksgiving dinner. Considering the recommended serving size of pumpkin pie has 323 calories (a Thanksgiving-sized slice with cool whip is likely over 500 calories) we blow it out of the water with this one at only 70 calories per (appox. 1/2 cup) serving. I took this recipe to a friend’s house for Turkey Day and everyone loved it, however many of them used it to top their pie. D’oh! This recipe makes approximately 8, 1/2 cup servings and should do the job of curbing that desire for pumpkin pie after dinner. If you try this recipe I hope you enjoy it and Happy Thanksgiving to everyone! 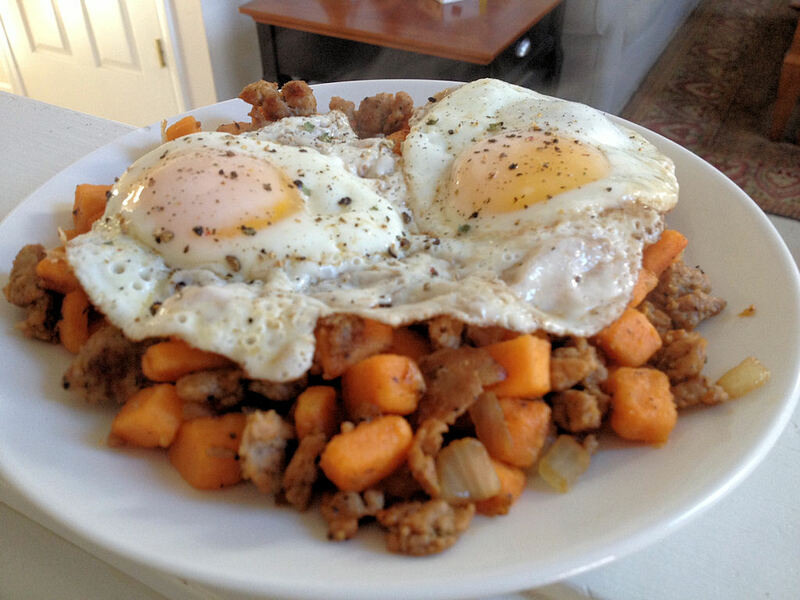 My take on the WW recipe, several variations can be found online. Add the pumpkin and pumpkin pie spice and blend until combined evenly. 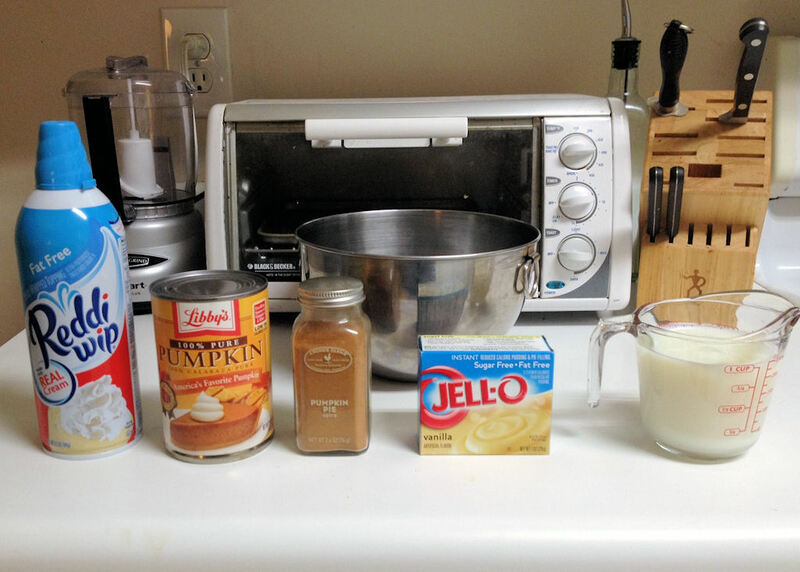 Add the can of Reddi Whip and fold into pumpkin mix, don’t get too aggressive here. The original recipe calls for fat-free Cool Whip which is sweetened and whipped partially hydrogenated oil (trans fats) which I try to avoid. Reddi Whip is a dairy product. You can try different ratios of pumpkin, whipped topping and pudding to get the consistency you prefer. You can try different spices or amounts to suit your preference. I decided to get creative the other night and this is what became of it. 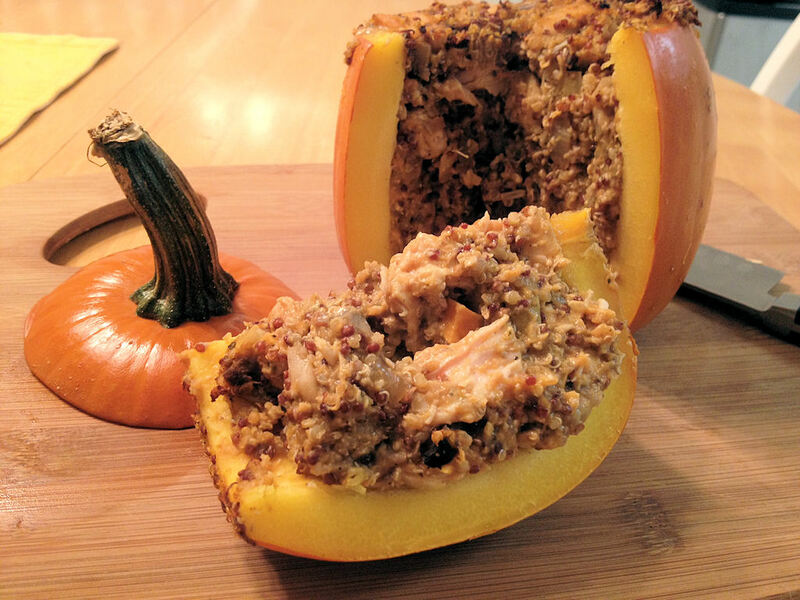 I picked up a small pumpkin and decided to try making a savory stuffing to bake into it. The stuffing is made up of chicken, quinoa, apples, sweet potatoes, mushrooms, onions and cranberries seasoned with the typical holiday spices of sage, thyme and nutmeg as well as salt, pepper and garlic. Rosemary and marjoram would be good choices as well. I used chicken in this version as that’s what I had on hand, however turkey would be a great choice and you could also use beef or lamb. Next time I make this I think I’ll add some water chestnuts and celery. You could also omit the pumpkin, add a bit more cream of mushroom soup and turn this into a casserole. I love the holidays and all the awesome food that goes along with them, but we all know what that can do to a weight loss plan. It’s nice to have some options for healthier choices that are still delicious and I think this fits the bill. 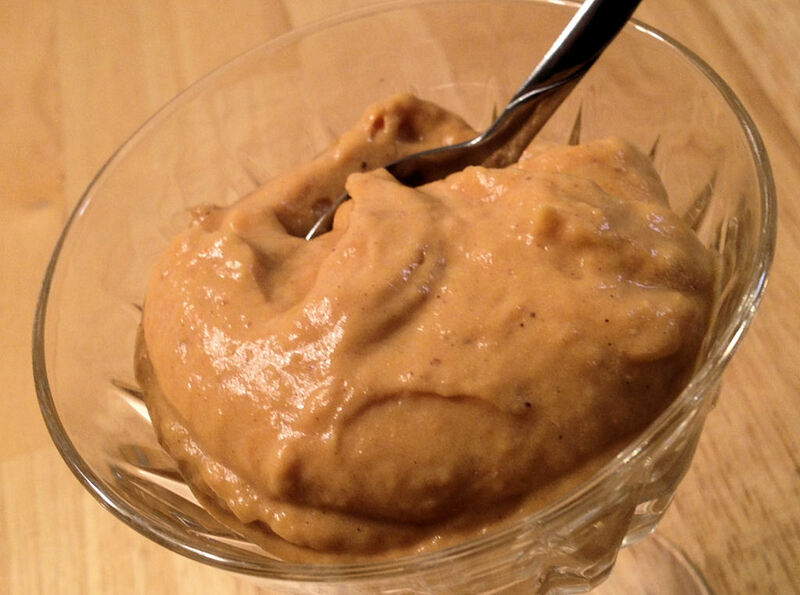 Check back soon for a great pumpkin mousse recipe that is only 68 calories per serving. 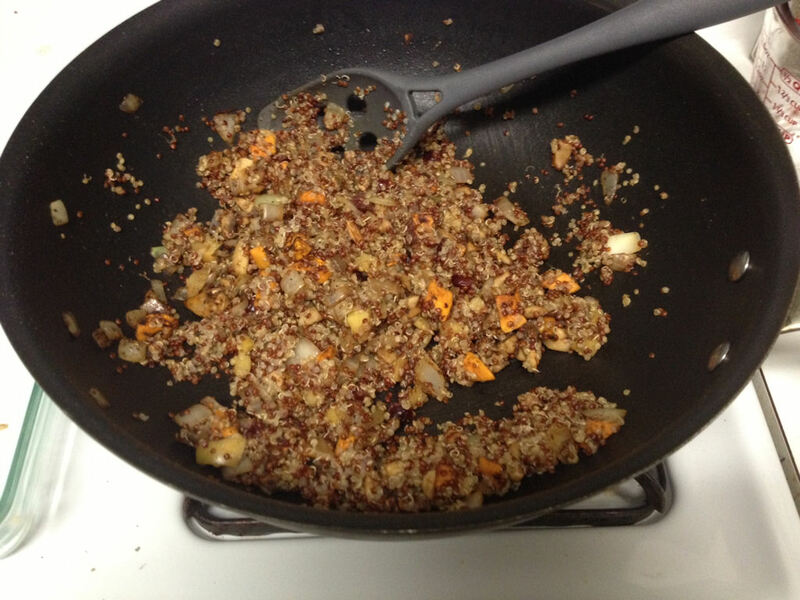 Add water, quinoa, apples, cranberries and sweet potato to pan. Add salt to taste and heat over medium heat. Once boiling cover and lower heat and simmer for approximately 15 minutes, stirring occasionally. 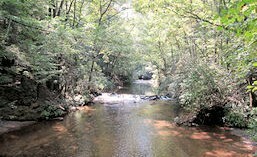 Quinoa should be moist with no standing water. While the quinoa cooks prepare your pumpkins but cutting the tops off much the same way you would for a Jack-o-Lantern and clean the insides. Next, heat saute pan over medium heat and coat with olive oil. Add onion and cook until slightly translucent then add mushrooms and continue cooking over medium heat until done heat to low. 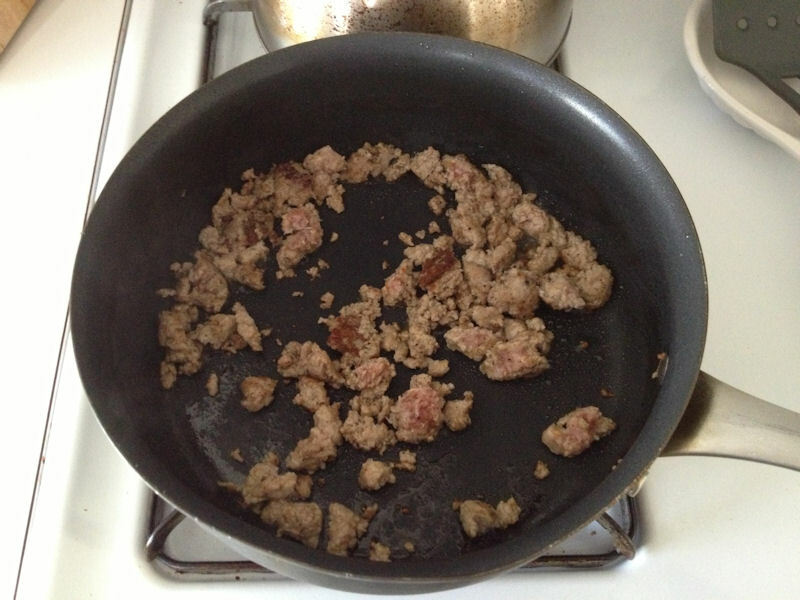 If necessary add additional oil to keep from sticking, but only in small amounts. Add quinoa, chicken and to onions and mushrooms in pan and mix thoroughly. Add cream of mushroom soup to give mixture a moist consistency but not wet, once cooked you’ll want your stuffing to be firm but moist. 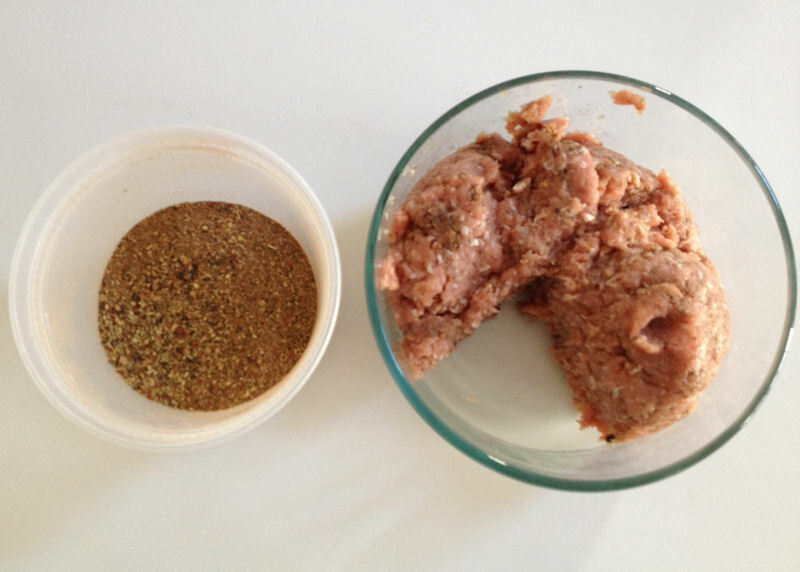 Season to taste with your choice of salt, pepper, garlic, sage, thyme, nutmeg, rosemary and/or marjoram. Bake pumpkins in preheated 350F oven for 35 – 45 minutes. Test pumpkin doneness by piercing close to top with fork and flaking slightly. Pumpkin should be tender and not too stringy. Remove from oven and let cool for 5 minutes then cut in half and serve. I will likely add some water chestnuts and celery next time I make this. This would be good with most ground meats. Chicken, beef, lamb and of course, turkey.